We have e-commerce, right? It follows that we should call online advertisements e-ads. Having said that, let’s look at banks and their devious ways. They believe that only men are their customers. 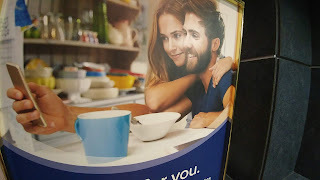 That is why they have these ads with the man in the house punching the computer while the woman looks adoringly at him. Banks are right about one thing, computers and other electronic devices control our lives: how and when we pay the auto loan, hydro, credit card, buy winter boots etc. It is called e-commerce, e-love or e-everything, because it happens in these devices. However, these e-ads where it is the man operating the computer, are way off base. Computers are gender neutral. There is no male or female. Banks hire advertising agencies to handle their accounts and they come up with suggestions. Why is it that banks never question why it is only men that are computer-savvy at home? Women only control computers in bank ads when they have their own business. Such ads are unrealistic. They don’t mirror the fact of life that there are two computers at home: Jack’s and Jill’s. Jill had her own computer before she met Jack. They fell in love, got married and had kids but their computers never married. There might be some adjustments like having a joint bank account to pay daycare, the nanny or groceries, but it is done on two computers. E-ads that show the man in the computer’s driving seat are therefore dinosaurs and should be sent to the Museum of Mankind somewhere. Which brings us to another topic: e-ads about washing dishes and cleaning toilets. Why are women main actors in these ads when millions of men live alone, love living alone and buy cleaning products to clean their homes?